More than 27 million people today in the United States—roughly 11 percent of the population—are living with heart disease, says the US Centers for Disease Control. It’s the nation’s No. 1 killer, resulting in approximately 600,000 deaths a year. Yet as many as 85 percent of these cases are preventable, says cardiologist Sarah Samaan, a spokesperson for the American Heart Association. Her Best Practices for a Healthy Heart: How to Stop Heart Disease Before or After It Starts, is designed to help people achieve what Samaan calls this “important and difficult” goal. Similar to Samaan’s The Smart Woman’s Guide to Heart Health, which received a ForeWord Book of the Year Bronze Award in Women’s Issues in 2009, Best Practices for a Healthy Heart provides proven, reliable, and empowering information about the diet, exercise, and lifestyle choices that can help prevent “the silent killer.” The condition gets its nickname from the fact that for some sufferers, a fatal heart attack is the first and only symptom. Not everyone experiences the tell-tale chest pain, shortness of breath, arm or leg pain, numbness, or related conditions like high cholesterol or high blood pressure. A stroke brought on by years of improperly controlled, dangerously high blood pressure and heart disease also led to her father’s death and more frustrating heartbreak for Samaan. Although her father was a doctor, he was also “a human being [who] did not want to admit [to] being anything less than invincible,” she writes. One of the many strengths of Best Practices for a Healthy Heart is that it compassionately but straightforwardly addresses the need to abandon this common disbelief—to dismiss the unrealistic It-Won’t-Happen-to-Me Syndrome—and take inventory of the realistic aspects of heart disease one can’t, can, and must control. In simple, easy-to-understand language, Samaan explains and outlines both controllable risk factors like weight, smoking, exercise, and drinking alcohol, and noncontrollable ones like age, race, and genetics. In keeping with current trends and public interest, full chapters are dedicated to stress management; vitamins, minerals, and complementary and alternative medicines; and the connection between heart disease and hormones. 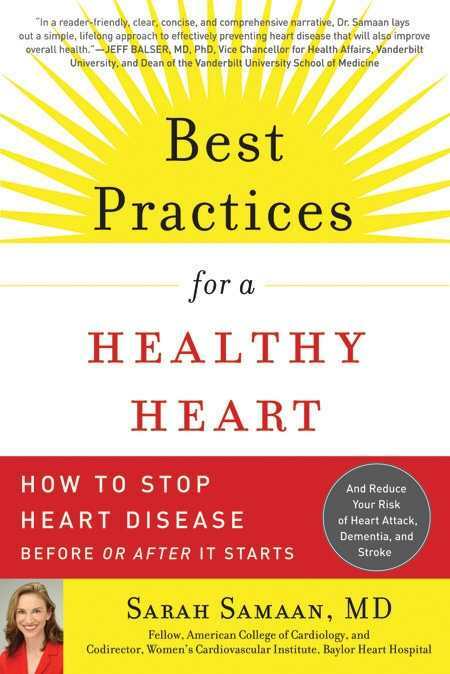 Written in the same personable, conversational style that undoubtedly contributed to her being named a “Texas Super Doctor” by peers six years in a row, Samaan includes in each chapter lists of heart-healthy best practices—steps that, when followed, are proven to help achieve optimum cardiovascular health. Best Practices for a Healthy Heart is a valuable, comprehensive guide for anyone looking to better understand or prevent heart disease and live a longer, healthier life.